She's Sew Crafty: MarkerPOP! + SP & Company - Tina Wenke Collection Blog Hop!!! MarkerPOP! + SP & Company - Tina Wenke Collection Blog Hop!!! 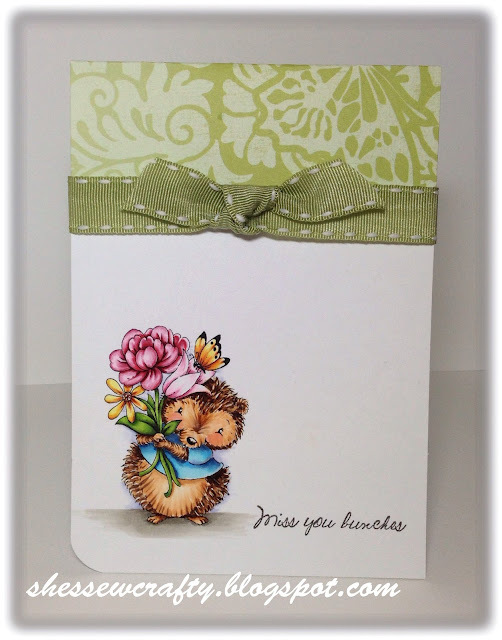 For my card, I chose the the Hedgie with Large Bouquet. He is such a cutie! I used some old paper to make the card base and ribbon from my stash. I went for a CAS card to emphasize the image. WOW!!! your coloring is AMAZING and the cards are just GORGEOUS!!! Beautiful coloring of such a cute image! Thanks for the chance to win! I am so in love with Hedgie I can't stand it... he is just too cute !! And your card is just stunning! Awesome coloring. The card design is lovely but I can hardly see it because my eyes are drawn to that awesome coloring... Did I tell you how awesome your coloring is? Aww, this is too, too cute! Great coloring and I love your CAS card...Perfect! This is gorgeous Danielle. 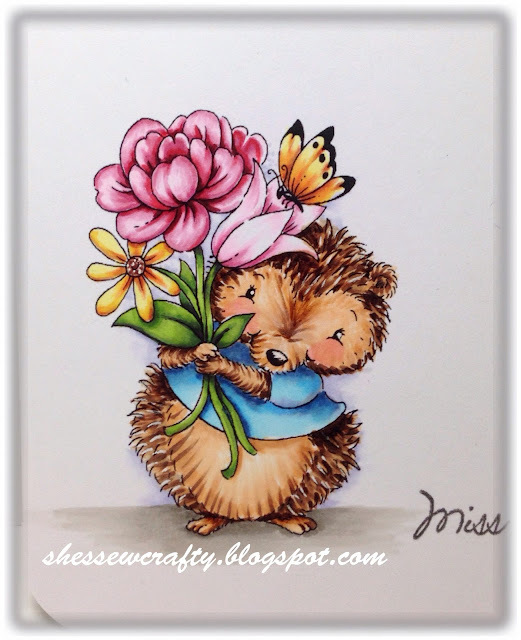 I love the image, but then I love hedgehogs, they are so sweet. Beautifully coloured and love the CAS design. Absolutely gorgeous CAS card! So sweet and wonderfully colored! Beautiful job! Love the coloring! Hedgie just makes my heart melt! Love how you have colored him and his bouquet. I will never be that good at coloring, I can just tell. YOU ARE AMAZING!!!!! He looks so sweet! His fur is just perfect--I can see where it's growing from even. Love the simplicity of this card! It is simple but YET gorgeous!!! Sweet! The more I'm seeing this stamp image the more I want it! Beautiful!!! Its so neat to share different takes on this guy! Love the card! Thanks for sharing! Very very cute. I love your coloring. You did a great job making him look so fluffy and cute. Love your bow too.